Home / Blog / Is “Alright” All Right? English has embraced already and altogether and although. But we are — for some reason — reluctant to embrace alright. Nearly all style guides and publishers insist that all right is the proper rendering and denounce alright. I find this weird. Not unexpected, however, since English isn’t much governed by logic. 1. It mirrors already and altogether. The distinction between already and all ready is clear enough: the former is an adverb and the latter is a compound adjective. You would say We are all ready to go or We are ready to go already. All together and altogether work the same way. It seems both logical and practical to distinguish all right and alright the same way: I got the questions all right on the quiz! or I did alright on the quiz. Alright! My team won the championship again! That’s my Uncle Tim alright! 3. Alright has been used in print at least occasionally since the early 19th century, according to Merriam-Webster online. It makes only a rare appearance, I admit, but that seems to be because writing guides have expressly forbidden its use. Keep in mind that they offer no reasons for rejecting it. As usual, grammar authorities simply issue edicts and expect them to be obeyed without question. I admit that all right remains the preferred option, but you can see the gradual increase in the appearance of alright since the 1960s. Keep in mind, however, that writing and style guides almost universally object to alright. It’s fighting an uphill battle when it comes to formal publication. Informal use is a different story. I would guess that it comes as a shock to many readers that alright isn’t considered a fully acceptable word. People write it all the time in texts, emails, and printed letters (Wait, does anybody even write letters anymore?). And Google tells the story. A search for alright on Google produces 151 million responses. A search for all right gets 217 million. The gap is considerably closer in the less grammatically regulated free market of the internet. This doesn’t make alright alright, mind you. But it shows that it’s generally accepted in common usage. 5. Dictionaries are already recognizing alright. Some list it as an informal or questionable alternative. Others, like the OED, simply call it an alternative spelling. Merriam-Webster online includes alright, but points out that it is rejected by many grammar authorities. The fact that I don’t get a red squiggly under it when I type alright in Word Press is a sign that it’s on the way to full wordhood. (Wordhood, on the other hand, gets the squiggle). 6. There’s just no good reason not to embrace it. Lots of people use it. It has a long history. Unlike many new usages, it adds nuance rather than erasing it. It’s a good word! I’m not on a mission. I don’t care that much, really. 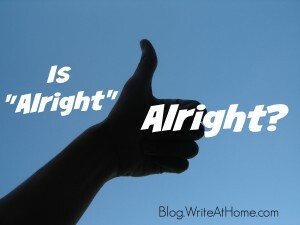 I will continue to use alright on the blog here, but I’m not staging any protest marches or letter-writing campaigns. I just think alright is alright. If you have a comment or a question, I’d love to read it. Please leave it in the Reply section below. Alrighty then! It seems to be just a matter of time before “alright” is fully acceptable. Until then I will continue to use “all right” in formal writing, but c’mon, grammar legislators! Ease up! How can it be all wrong when it feels so alright?! I really like your balanced approach, Brian. It’s good to know the rules, and explanations behind various words, phrases, practices, but also to have a relaxed attitude about the things that don’t really matter. I always come away from your posts feeling more informed, yet relaxed. That’s a good thing 🙂 Thanks! It’s definitely a good thing. Thanks, Lori!